Here's the latest for Friday February 15th: Trump expected to sign border deal, declare emergency; Pompeo meets EU Foreign Policy chief; Amazon pulls out of NYC deal; Floods in California. 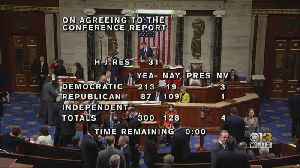 WASHINGTON (AP) — Congress lopsidedly approved a border security compromise that would avert a second painful government shutdown. 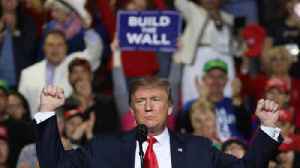 But a new confrontation has been ignited — this time over..
▶ Videos for "Sign Border"
Reuters reports that President Donald Trump is ready to declare a national emergency at the U.S.-Mexico border. It's a move that Democrats vowed to challenge as an unconstitutional attempt to fund his..
President Donald Trump will sign a border security bill to avert another government shutdown, but also declare a national emergency to try to obtain funds for his promised U.S.-Mexico border wall, a..
Senate Majority Leader Mitch McConnell said Thursday afternoon that President Trump will sign a compromise bill to fund border security, but he will declare a national emergency to build the wall. Trump Plans to Sign Border Deal The border security deal will prevent another partial government shutdown. 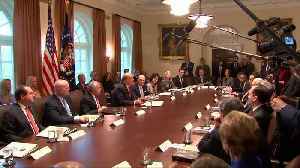 President Trump said that he was "not happy" with the tentative deal reached late Monday.. The compromise bill will provide some funding for a physical border barrier, but far less than the $5.7 billion President Trump sought for a wall. 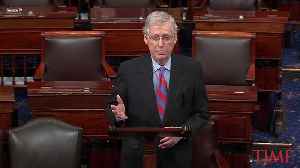 Senate Majority Leader Mitch McConnell (R-KY) announced that Donald Trump will sign a compromise bill to avoid a government shutdown, and will also declare a national emergency in order to try and..
Republican Sen. Chuck Grassley says he's praying that President Trump will sign the border security deal into law to prevent a government shutdown. Sen. Lindsey Graham seemed to have more faith than..
Republican Iowa Senator Chuck Grassley called on members of the United States Senate to pray that President Donald Trump will have the “wisdom” to sign Congress’s border security bill Thursday..
President Donald Trump is set to give remarks Wednesday afternoon, amidst reports he intends to sign a bipartisan deal to avert a government shutdown and fund a small part of his border wall. 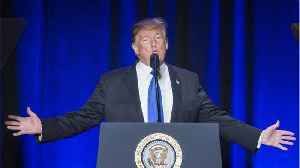 Trump is..
President *Donald Trump* held a pool spray in the Oval Office on Wednesday, during which, he was ambiguous on whether he'll sign the bipartisan spending bill being floated through Congress before the.. The US President Donald Trump intends to sign the border security deal to avoid another partial government shutdown, CNN reported this Tuesday - citing two sources who spoke directly with the..
Donald Trump plans to sign the border security deal reached by congressional negotiators in order to avoid another partial shutdown of the federal government, CNN reported on Wednesday, citing two..
CBS News has learned President Trump will "very likely" sign an agreement to avoid another government shutdown. Associated Press White House reporter Jill Colvin joins CBSN to discuss the latest..
President *Donald Trump* told reporters on Tuesday that he isn't pleased with the latest bipartisan spending proposal to keep the government open before it slides back into a shutdown. 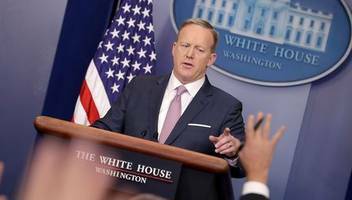 Will Sean Spicer mention Dow 20,000? · **SPICER: `PRODUCTIVE' CONVERSATION YDAY WITH CONGRESS LEADERS* · **SPICER SAYS TRUMP TO TAKE STEPS TO SECURE BORDERS* · **TRUMP TO SIGN BORDER SECURITY..